As you see it, scratch it off the list! So, you’ve put in a lot of hours in front of the TV, digesting some of history’s greatest shows like some sort of TV… digester. And, yeah, you get the satisfaction of having seen them, but isn’t it more satisfying to show off what a TV Tsar you are? 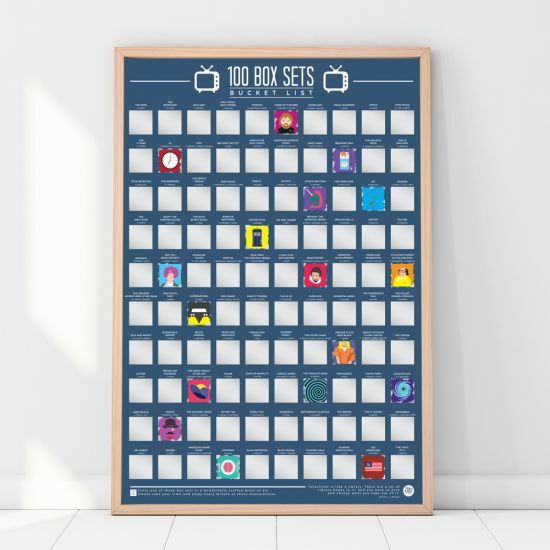 Well, with this 100 Box Sets Bucket List scratch poster, you get to show off while you scratch off! This poster features 100 must-see, your-life-would-be-incomplete-without-them TV series. It’s a list of shows that you absolutely have to see before you kick the bucket. And, as you chew your way through them, you can scratch them off the poster. Actually, you’ll be scratching the silver coating off the poster and revealing some awesome artwork… a little reward for your hard hours on the sofa! This box set bucket list is perfect for any TV fanatic with a taste for the dramatic, or the bombastic… or, like, comedy and stuff. Remember, someday isn’t a day of the week. So, if you want to say that you have seen 100 of the greatest TV shows of all time, start watching today! And, if you want to show off your supreme TV tackling talents to your friends and family, get your 100 Box Sets Bucket List Scratch Poster today… too! As you rub off the box sets, you’ll be rubbing it in!